The International LOFAR Telescope has made a new announcement regarding one of their discoveries. 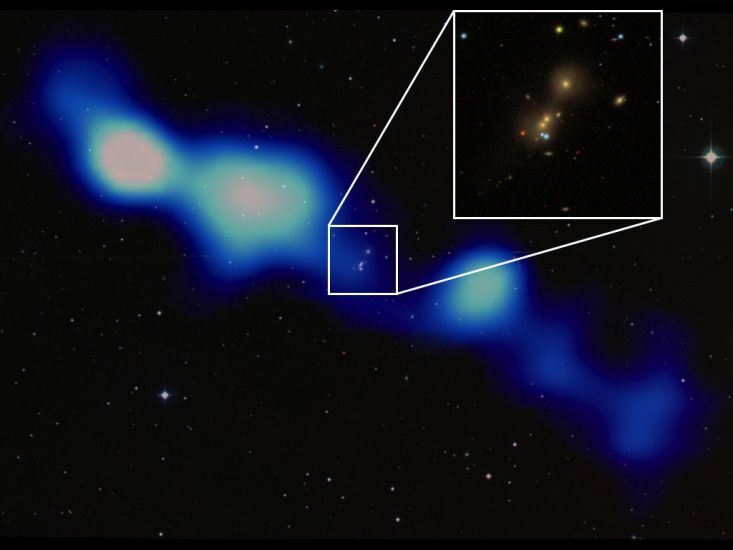 Their press-release states that a team of astronomers led by Dr. George Heald (ASTRON) has discovered a previously unknown gigantic radio galaxy using the International LOFAR Telescope (ILT). The discovery was made as LOFAR conducted its first all-sky imaging survey: the Multifrequency Snapshot Sky Survey (MSSS). Using early MSSS images, the astronomers have identified a new, huge source that represents material ejected from the center of the galaxy tens to hundreds of millions of years ago, and now stretching across millions of light years of intergalactic space. If this newly discovered galaxy were visible by eye, it would be larger than the full moon. The MSSS survey is still ongoing, and hopes to discover many new sources like this one. The new galaxy is a member of a class of objects called Giant Radio Galaxies (GRGs). GRGs are a type of radio galaxy with extremely large physical size, suggesting that they are either very powerful or very old. LOFAR’s extreme sensitivity to large objects like this one, combined with its operation at low frequencies that are well suited to observing old objects, make it a powerful tool to find new GRGs like this one. The centre of the new GRG is associated with one member of a galaxy triplet known as UGC 09555. The central galaxy is located at a redshift of z=0.054536, or 750 million light years from Earth. The central radio source was previously known and has a flat radio spectrum, typical of giant radio galaxies. LOFAR’s MSSS survey is a concerted effort to image the entire northern sky at very low radio frequencies, between 30 and 160 MHz (wavelengths from 2m to 10m). The primary aim of the survey is to perform an initial shallow scan of the sky, in preparation for deeper observations yet to come.